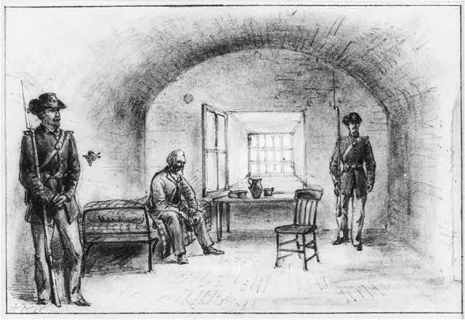 On May 19, 1865, Davis was imprisoned in a casemate at Fortress Monroe, on the coast of Virginia. He was placed in irons for three days. Davis was indicted for treason a year later. While in prison, Davis arranged to sell his Mississippi estate to one of his former slaves, Ben Montgomery. Montgomery was a talented business manager, mechanic, and even an inventor who had become wealthy in part from running his own general store. However, floods ruined Montgomery's early years at the reins, and he was unable to turn an early profit. The Davis family was unwilling to forgive the debt of their former slave, and he lost the land. Montgomery never recovered, and died soon after. After two years of imprisonment, he was released on bail which was posted by prominent citizens of both northern and southern states, including Horace Greeley, Cornelius Vanderbilt, and Gerrit Smith (Smith, a former member of the Secret Six, had supported John Brown). Davis visited Canada, Cuba and Europe. In December 1868, the court rejected a motion to nullify the indictment, but the prosecution dropped the case in February 1869.